The Perseus Cluster (Abell 426) is not a star cluster, but a galaxy cluster, and a truly massive one too! 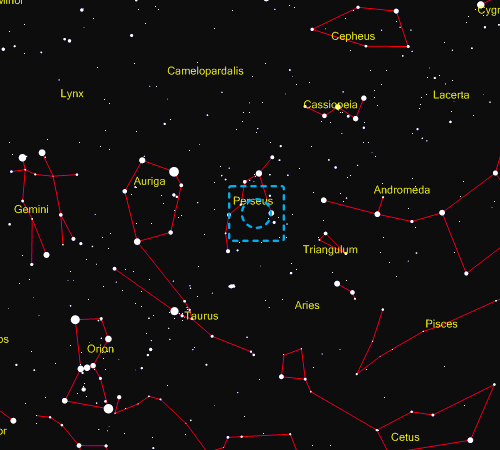 It is located in Perseus, just east of Algol, where Medusa's slain head appears. The apparent diameter of the cluster is about 860' or just over 14º. 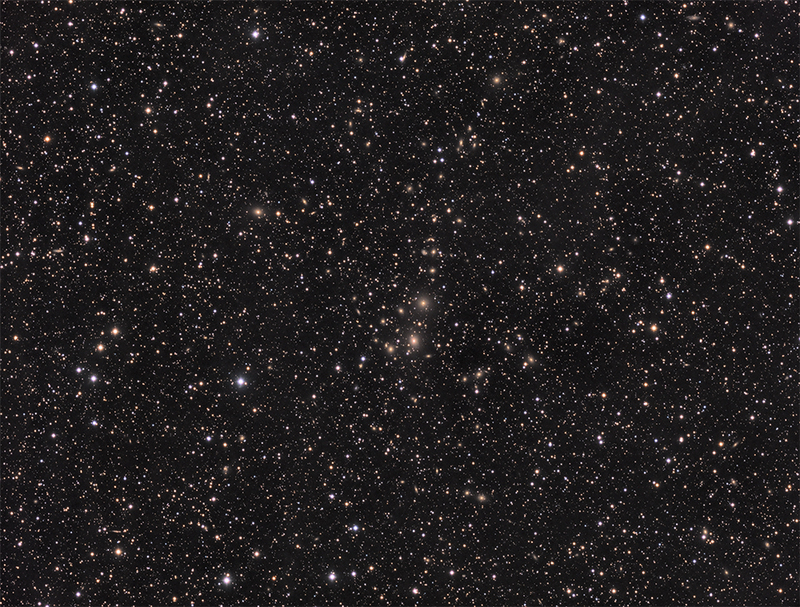 The field of view of this image is a maximum of 1.8º, so only around 2% of the whole galaxy cluster. The Perseus Cluster is huge! In fact, it is one of the most massive objects in the known universe. It is situated around 240 million light years away from Earth and contains thousands of galaxies. This image contains 287 identified PGC objects, roll your mouse over the image to view the annotated version. The space between the galaxies of the Perseus Cluster is filled with extremely hot gas at temperatures of tens of millions of degrees. The whole cluster appears to be receding at approximately 5400 km/s or 1.8% the speed of light, which is unusually high. The central bright galaxy in the image, Perseus A or NGC 1275, is of great interest and has been a focus of scientific research for many years. A little known fact is that NGC 1275 is made of two different galaxies. NGC 1275 spans over 100,000 light years and is some 230 million light years away. It is a Seyfert galaxy that emits abundant radio and X-ray signals. Glowing filaments extending from the galaxy trace bubbles of gas blown violently outwards by a black hole. These 'radio bubbles' are seen as holes in the X-ray image of the cluster, as they push away the X-ray emitting gas. In 2003 a team of astronomers led by Dr. Andrew Fabian at Cambridge University discovered one of the deepest notes ever detected, a B♭, after 53 hours of Chandra observations. No human will actually hear the note, because its time period between oscillations is 9.6 million years, which is 57 octaves below the keys in the middle of a piano. The sound waves appear to be generated by the inflation of bubbles of relativistic plasma by the central active galactic nucleus in NGC 1275. The Perseus Cluster provides a glimpse of the advances that X-ray detectors are bringing to astrophysics. In the 1980s US researchers pioneered the technology and although its run was brief, the Perseus Cluster was its most successful application. Abell 426 also houses its own secrets; a Chandra X-ray observatory scientist detected unknown signals that have been interpreted as most likely to be dark matter. Further results suggesting dark matter have been recorded several times in reference to Abell 426. In 1977 Jõeveer and Einsatz proposed the question that the universe has cell structure. They suggested that superclusters were surrounded by large empty voids. Research on Abell 426 provided evidence in support of their theory. The Perseus cluster has been known for over a hundred and fifty years, but ever changing technology allows it constantly to be viewed in a different light. The Perseus Cluster has already been responsible for many discoveries that have changed science and in the future may be responsible for many more.